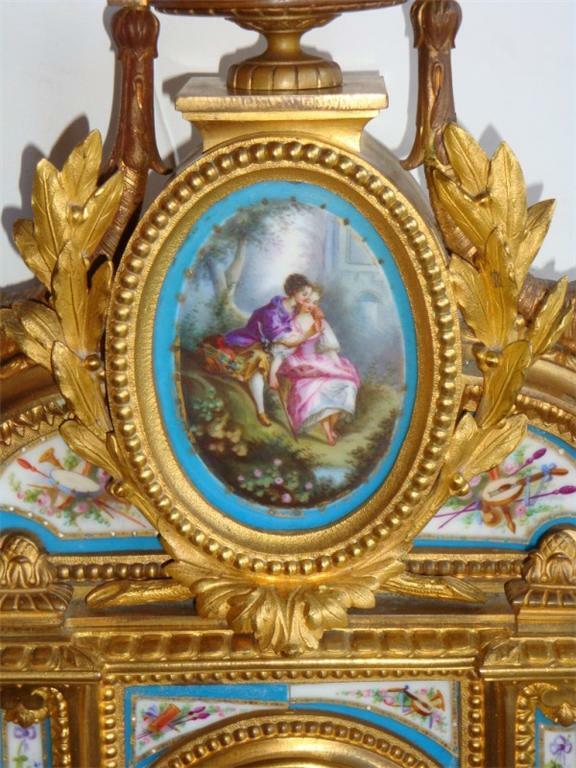 A Magnificent Musuem Quality 19th Century French Enamel dial flanked by figures of Cupid and Psyche, on a lapis and malachite base. Comes with Certified Appraisals. 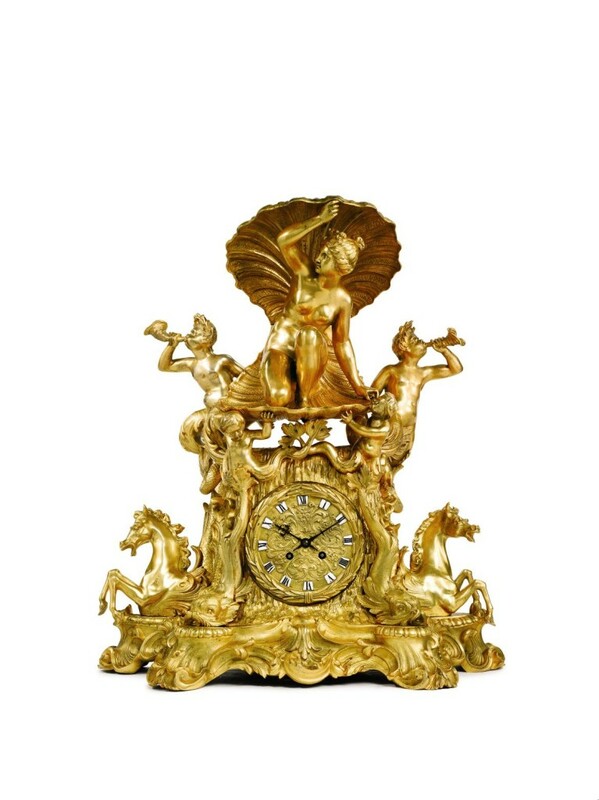 A Large and Impressive 19th Century Museum Quality Louis XVI French Ormolu, Patinated BronzeGilt Bronze Mantel Clock depicting the Birth of Venus, Magnificently done with Exquisite and Fascinating Detail. 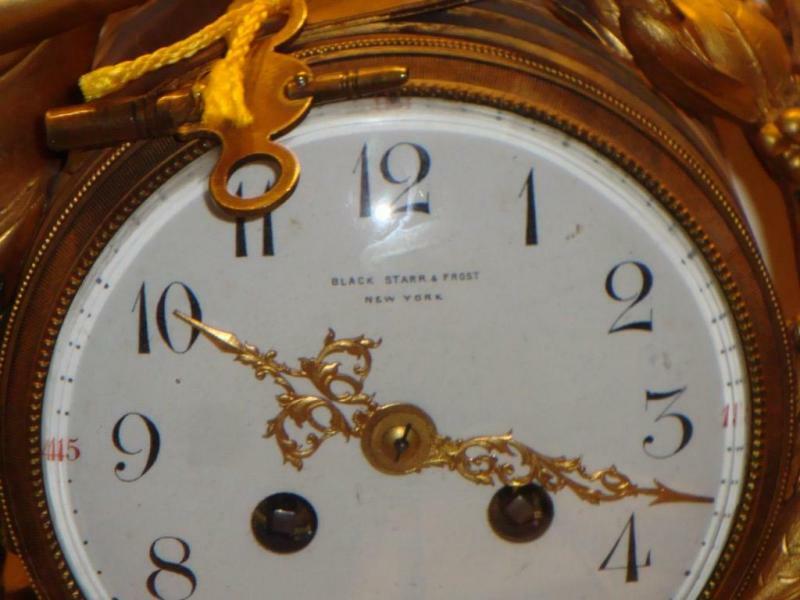 Taken out of a Prominent New York City Collection. Comes with Certified Appraisals. 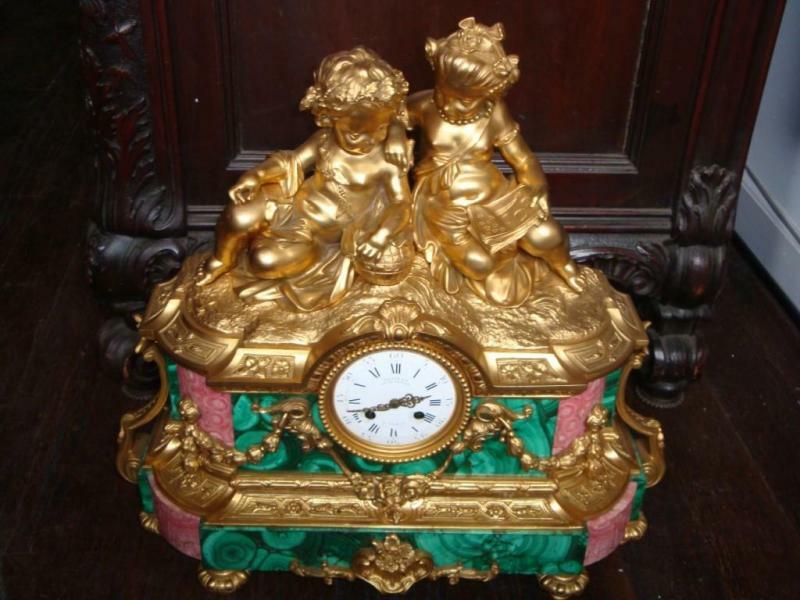 A French 19th Century Malachite, Dore Bronze, Rhodochrosite Crystal, Mantle Clock surmounted by Two cherubs. 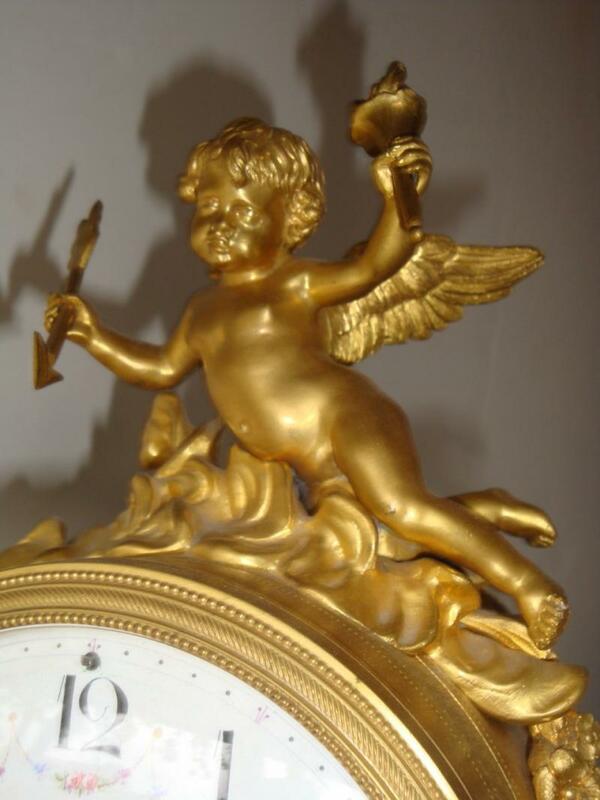 One Female Cherub, holding a Pen and Paper with her arm hanging around a Male Cherub. 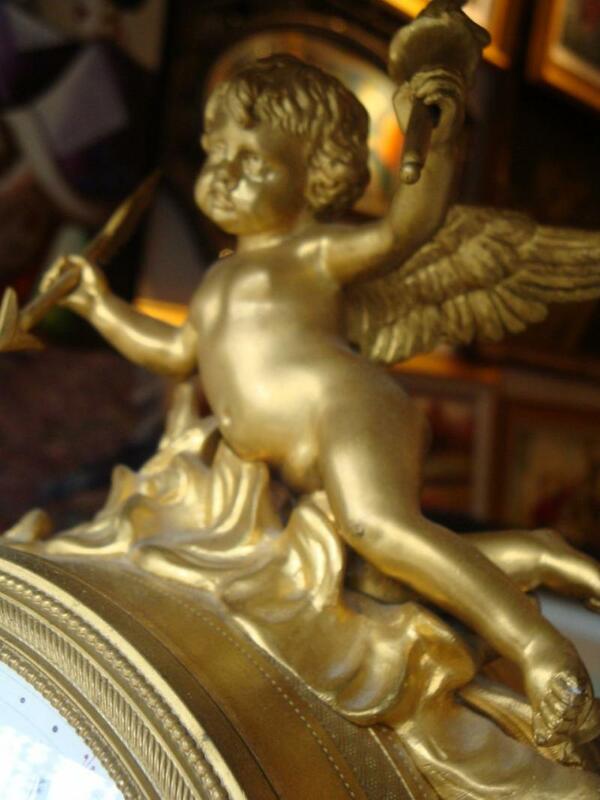 The Male Cherub is leaning against a globe. 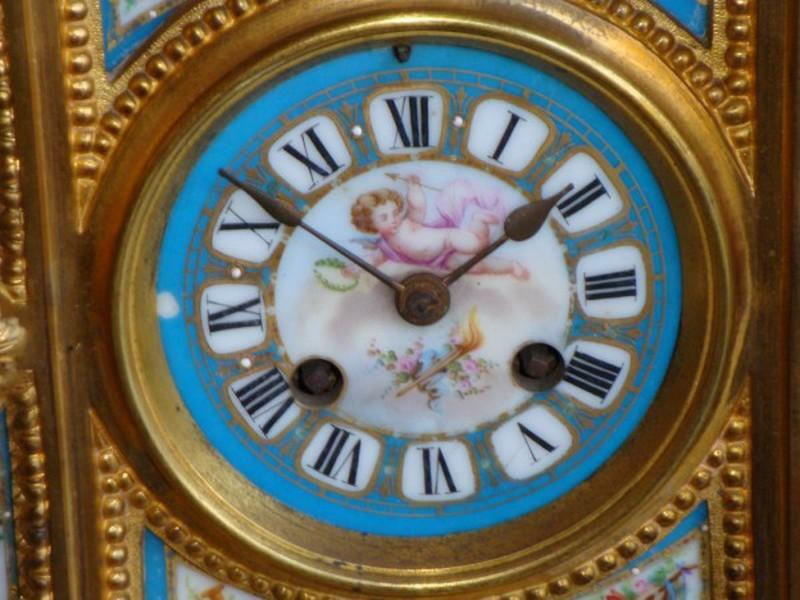 The enameled dial with English and Roman Numeral chapters, signed "Deniers a de Bronzes", "A Paris". A Rare Museum Quality Masterpiece!!! Comes with Certified Appraisals. 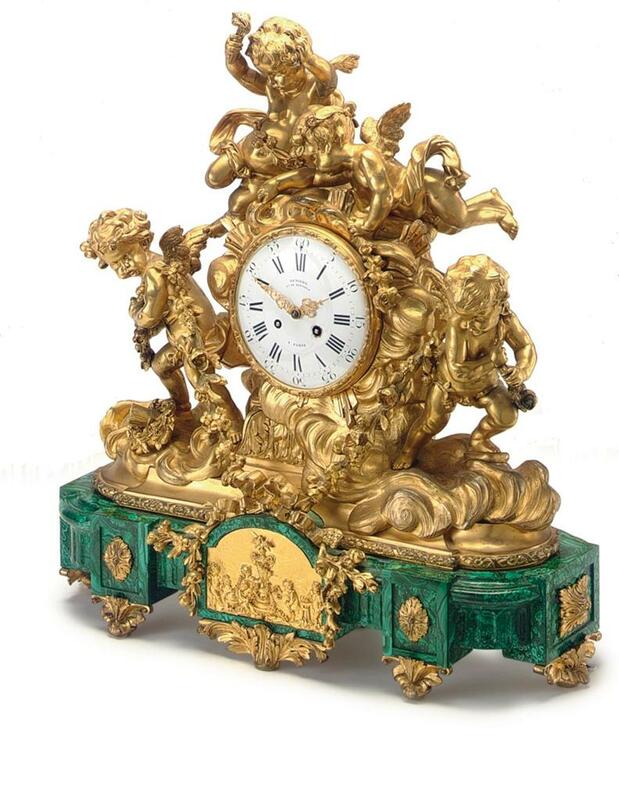 A Magnificent Louis XVI Style Gilt Mantle Cherub 3 Pc Clock Set, circular white enamel dial with Floral Wreaths and Numbers enclosing reticulated hour/minute hands above twin key escapements within a convex glazed bezel and beaded trim flanked by a Large Winged Cherub, together with a pair of cherub figural Four-light candelabra, each modeled in a standing position holding the candelabras up. 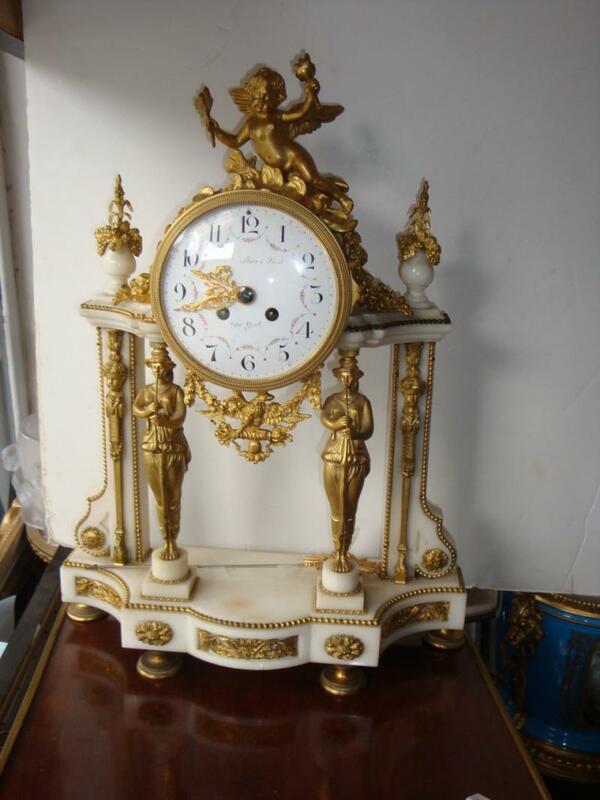 Clock and Candelabras are Standing Beautifully on White Marble Bases. An Absolute Masterpiece!!! Comes with Certified Appraisals. 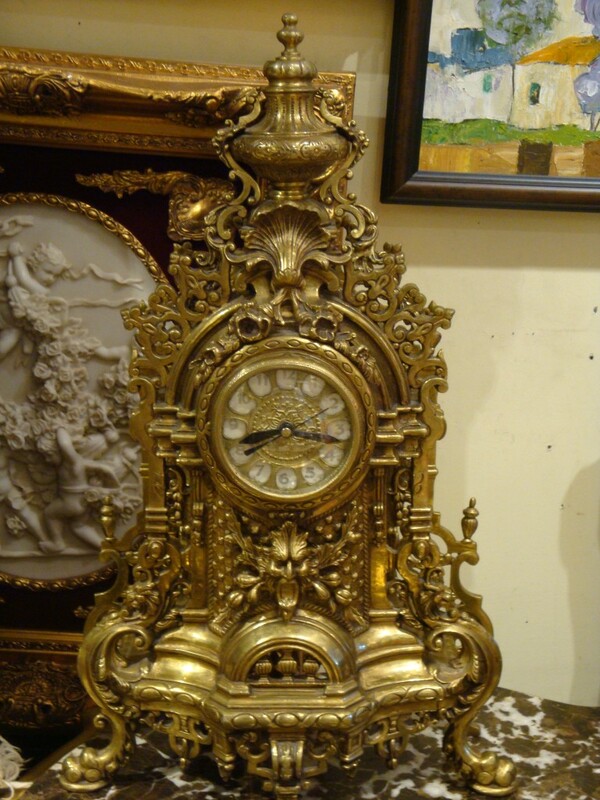 A Magnificent English Gilt Brass Mantel Clock. 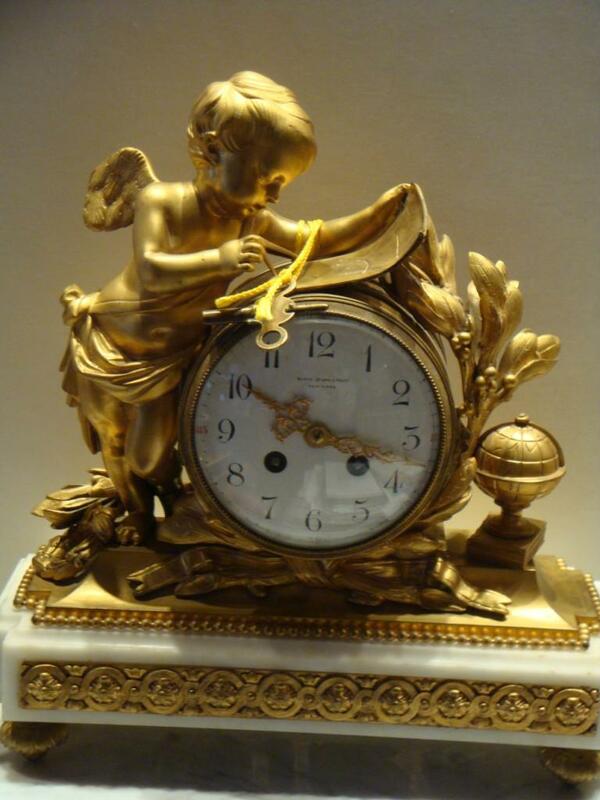 Clock is Beautifully Comprised with a Bird Form Finial over the Circular dial with English Numerals, flanked by Exquisite Scrolling. An Absolute Masterpiece.!! 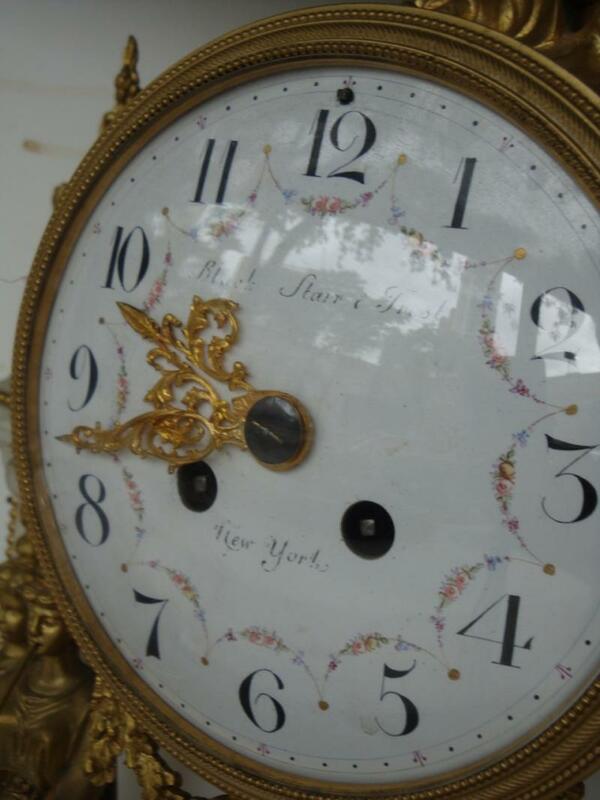 Provenance: Taken out of a Private New York City Collection. Comes with Certified Appraisals. 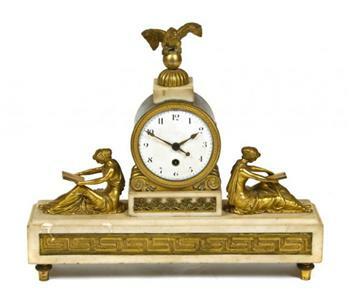 A Magnificent 19th Century English Gilt Bronze and White Marble Clock. 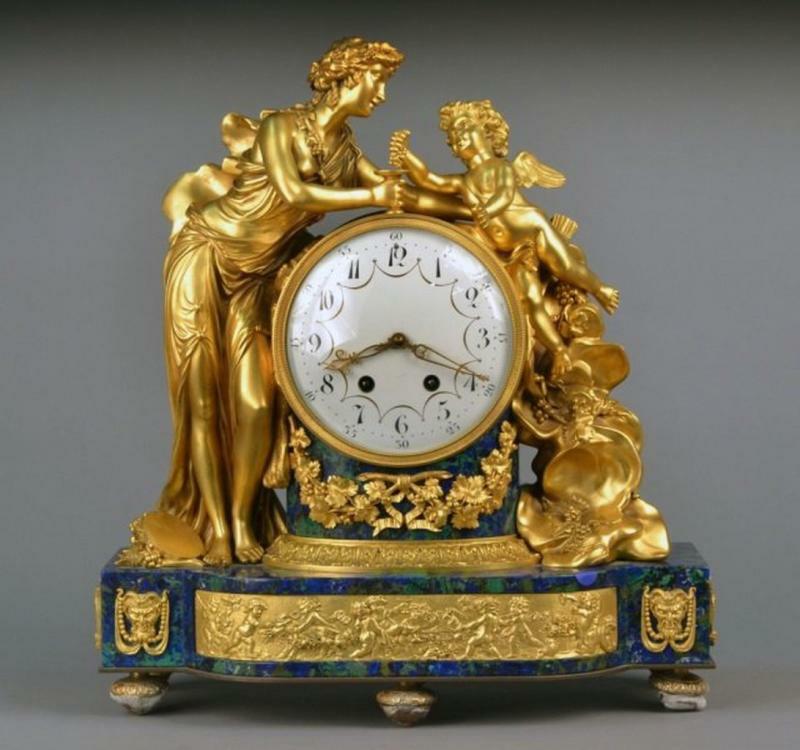 Clock is Beautifully Comprised with a Bird Form Finial over the Circular dial with Arabic Numerals, flanked by Classical Maidens reading, the Base withion inset Greek Key decoration. An Absolute Masterpiece!!! Provenance: Taken out of a Private Chicago Collection. Comes with Certified Appraisals. 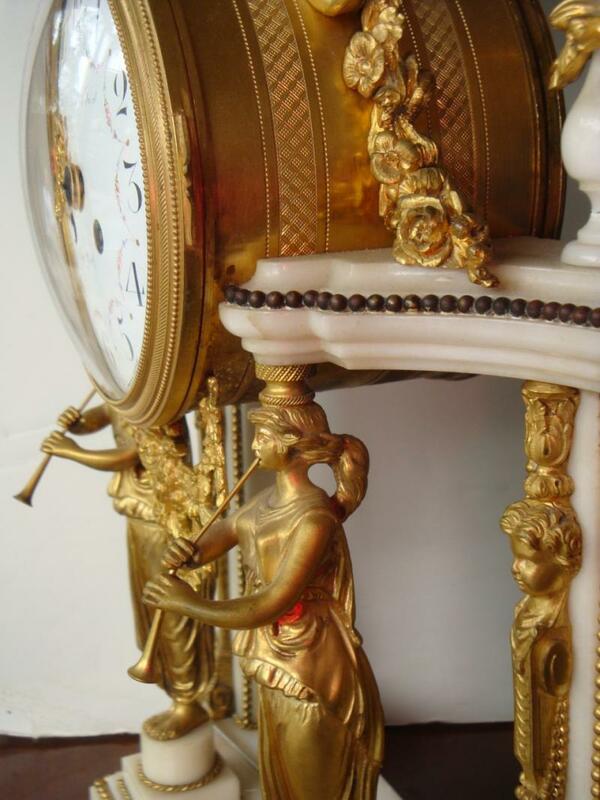 A Magnificent Rare Importnat Large Louis XVI Style Gilt Bronze and White Marble Mantle Clock Set, Black Starr & Frost of New York, circular white enamel dial with Hour Numbers enclosing reticulated hour/minute hands above twin key escapements within a convex glazed bezel and beaded trim flanked by maidens on each side and a Beautiful Sun Shaped swinging Pendulum. Measyrements: 21 H" x 16" W.
An Absolute Masterpiece!!! Comes with Certified Appraisals!!! We are in the process of liquidation and are listing our items below dealers prices in order to stay in business!!! 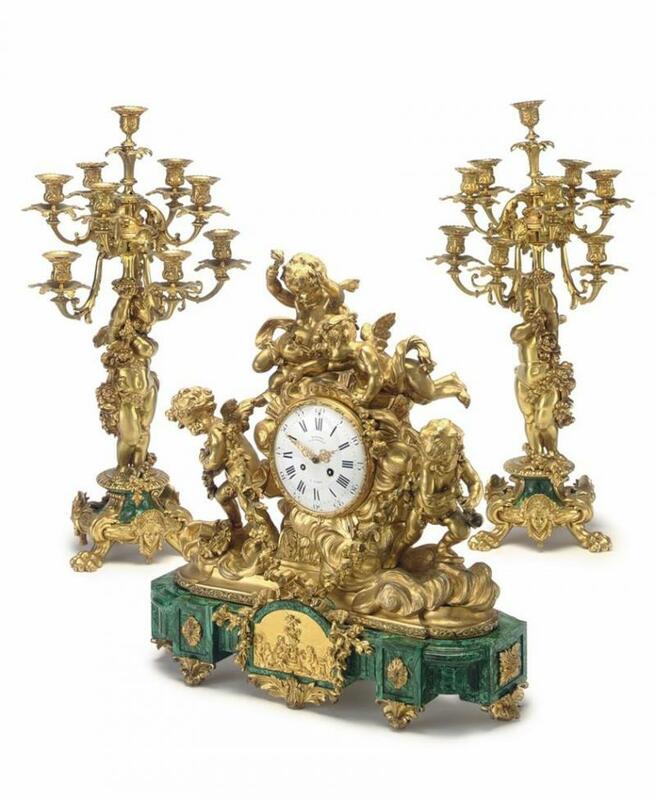 A Magnificent Musuem Quality 19th Century French Ormolu-Mounted and Malachite-Veneered Three-Piece Garniture De Chemine Clock Set. 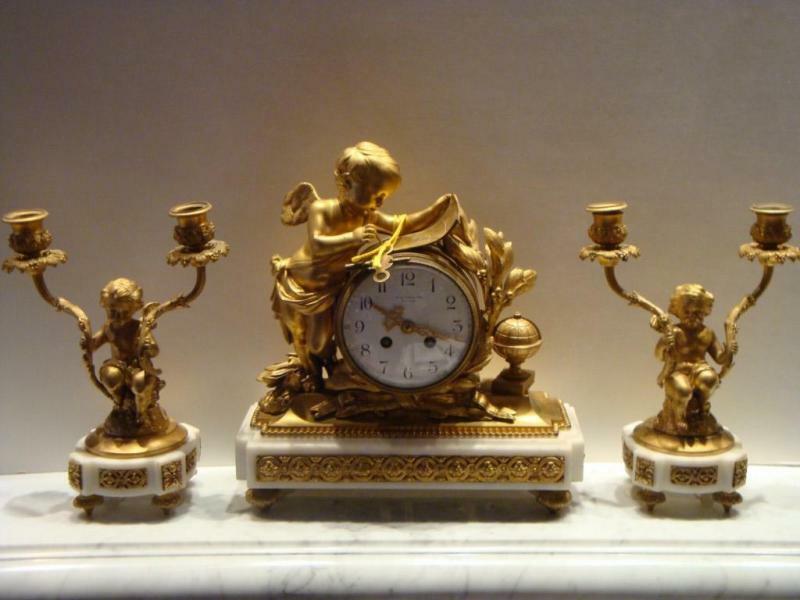 The Clock by Deniere, the Candelabra by Henri Picard, comprising a clock and a pair of ten-light candelabra; the clock cast with winged putti amidst swirling clouds, above a circular dial signed DENIERE/FT DE BRONZES/ A PARIS, on a shaped base centered by a relief plaque, the movement with further Denière cachet, the candelabra modeled as a male or female winged putto holding aloft scrolled candle branches, each stamped PICARDFES, on paw feet. Taken out of a Private Beverly Hills Collection. Comes with Certified Appraisals. 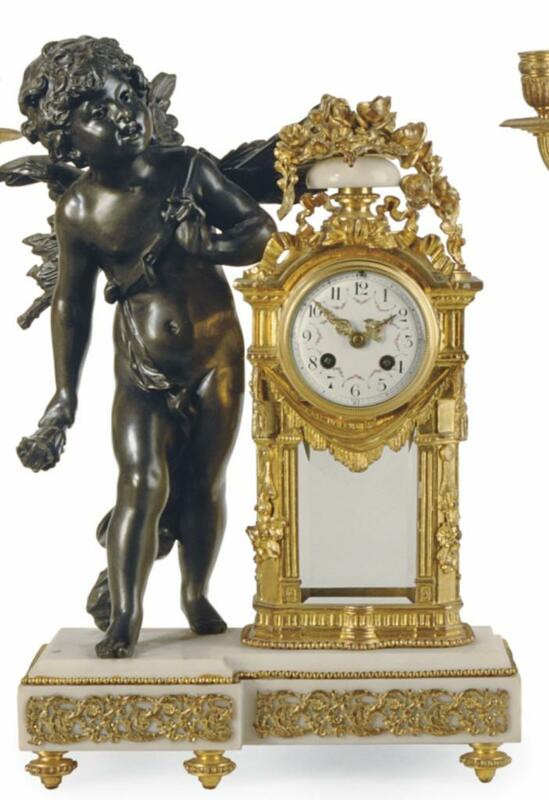 A Magnificent Louis XVI Style Gilt Bronze and White Marble Mantle 3 Pc Clock Set, Black Starr & Frost of New York, circular white enamel dial with Arabic chapters enclosing reticulated hour/minute hands above twin key escapements within a convex glazed bezel and beaded trim flanked by a cherub with a compass and chart representing geography, opposite a berried laurel branch and a globe on a shaped rectangular cavetto beaded base and conforming plinth with guilloche paneled plinth, raised on foliate cast pinecone feet, the movement stamped with circular Samuel Marti M daille d'Or seal and Paris 1900, beneath Black Starr & Frost. 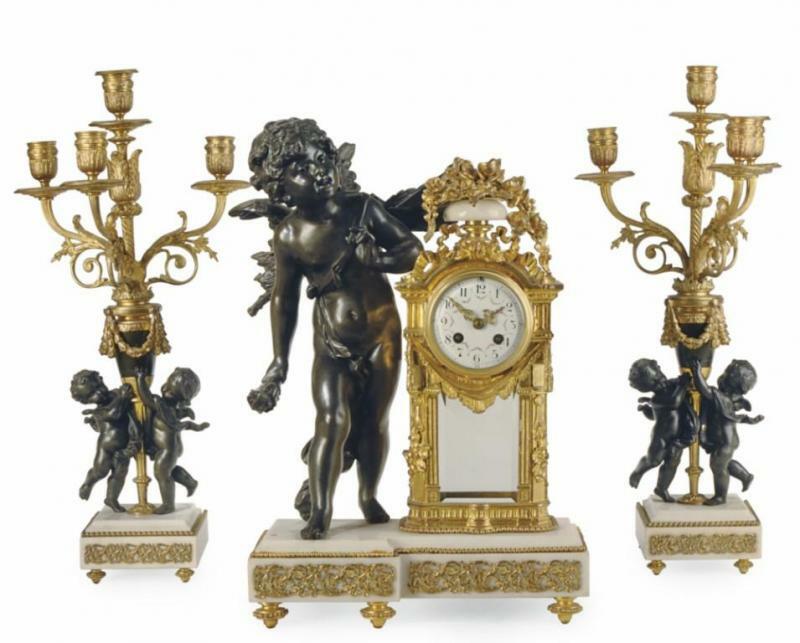 Height: 13"; together with a pair of cherub figural two-light candelabra, each modeled in a seated position holding aloft grape cluster and leaf cast branches on a shaped circular plinth centering reticulated guilloche panels and raised on black toupie feet. Height: 10 1/4". An Absolute Masterpiece!!! Comes with Certified Appraisals!!! 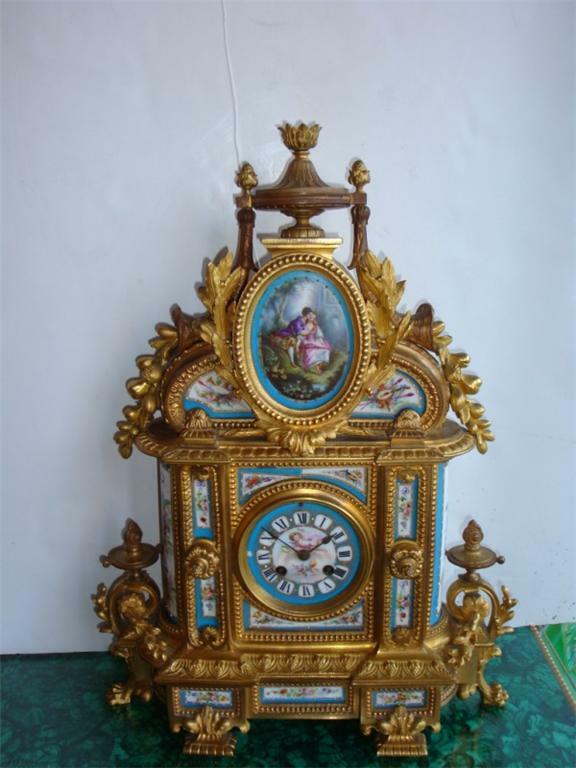 A Rare Ormolu-Mounted Sevres Tuquoise Ground Mantel Clock, Late 19th Century, Iron-Red 1245 to the Plaques, the movement stamped JAPY FRERES & CO. , MED. 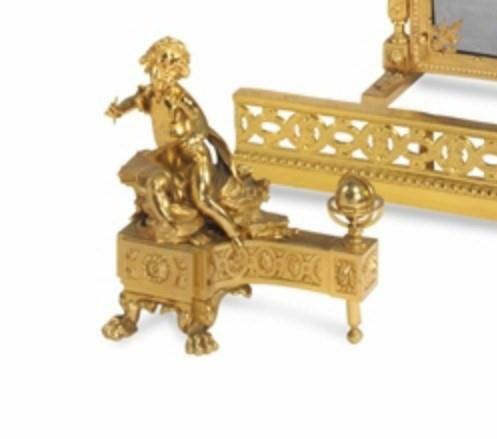 (AILLE) D'HONN (EUR), MF & F, 2371 AND 15...3, the Ormolu Stamped 2371 and MF at the Reverse of Architectural Form Cast with berried laurel branche, acanthus, and cornucopiae spilling fruit and surmounted by a panel painted after Watteau with an amorous couple, the other panels with Ribbon-tied floral festoons and amatory trophies. This piece was originally priced in our gallery for $16,000. An Absolute Masterpiece!!! Comes with Certified Appraisals. 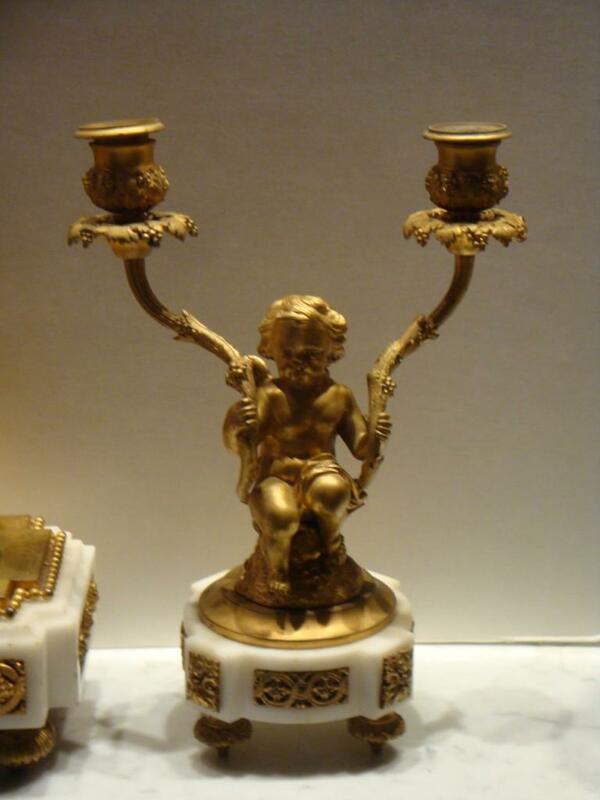 An Exquisite Pair of Museum Quality Estate Finely Patinated Bronze Figural Andiron Chenets Circa 1900. 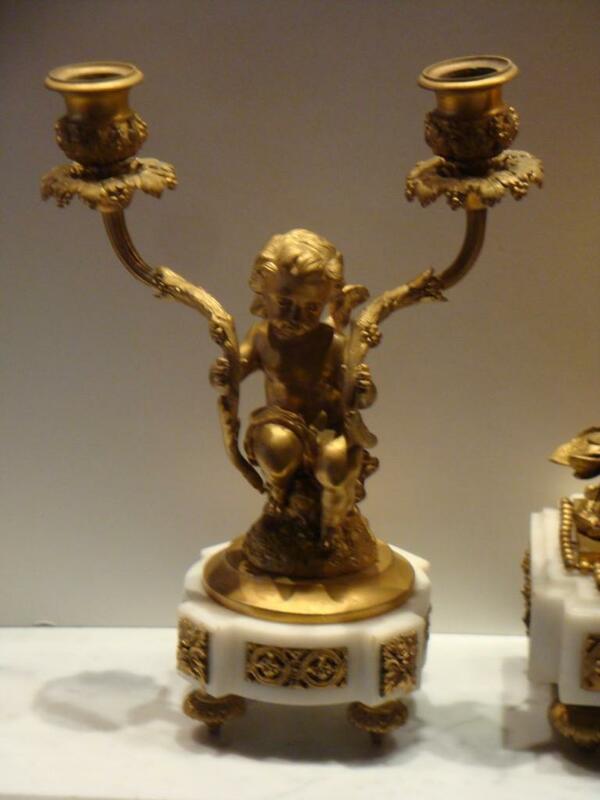 Each modeled with a Cherub on each side standing on Paw Feet. 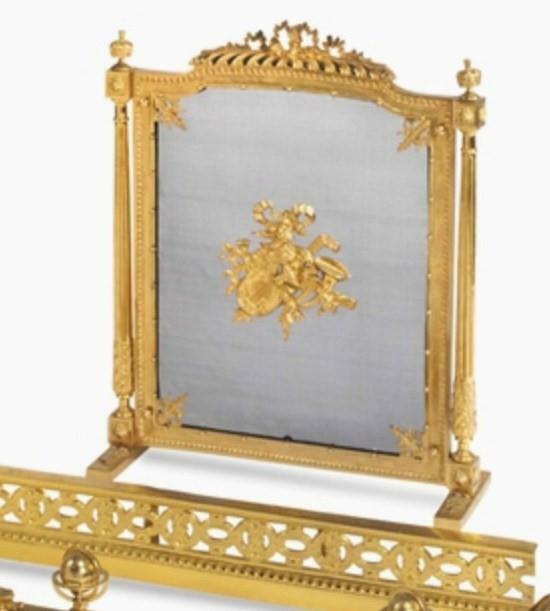 The Chenets are flanked by a Magnificent Fancy Bronze Medallioned Firescreen and Fender. 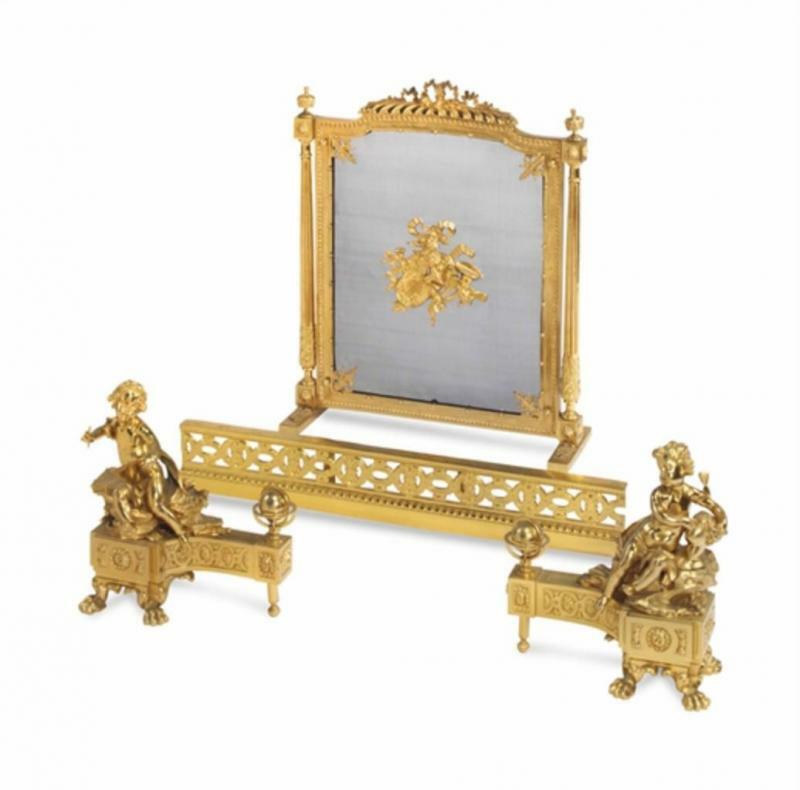 Taken out of an Important Rare Fifth Avenue New York City Estate Collection. AMagnificent and Monumental Collection!!! Comes with Certified Appraisals. LAST CALL, LAST CHANCE!!! LIQUIDATION SALE!! !